The observation that many Qur’anic passages are dialogical has been apparent to its readers from medieval to modern commentators. Its utterances frequently consist of dialogues between God, its announcer and audience, as well as Biblical and non-Biblical characters. Scholars have devoted substantial attention to character dialogues and the study of genre. However, we have not yet fully exploited the potential relationship between the Qur’an and Late Antique question-and-answer literature. 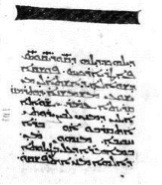 Syriac text (in MS London British Museum Add. 14,533, ca. 8th-9th c.) including twenty-three questions by Thomas the monk in the cloister on Mar Bassos in Egypt to John Philoponus (Yahya al-Nahwi, d. ca. 570). Each question consists of two parts, an orthodox thesis and a Tritheistic antithesis, and ends with a yes-or-no dilemma concerning possible answers. We might think of the Qur’anic text as divine responses to questioning audiences. Indeed, as Sidney Griffith argues in The Bible in Arabic (2013), the Qur’an insists that it recalls, answers, and corrects earlier Jewish and Christian notions regarding scripture and revelation. For example, Q 2:140 adjudicates between Jews and Christians regarding the true ancestry of the Biblical Patriarchs: “Question: Were Abraham, Ishmael, Isaac, Jacob, and the Tribes [of Israel] Jews or Christians? Answer: Who knows better, you or God?” In this illustration, the Qur’an recollects a disputation in order to answer it in kind. Why might the Qur’an find this method of question and answer so popular? One suggestion is that the Qur’an found its literary inspiration from the Late Antique context in which it materialized. By the sixth century, Jewish and Christian authors commonly used the question-and-answer genre for instruction, scholarly debates, and oral contests. For instance, 1 Kings 10:1 mentions that the Queen of Sheba tested Solomon with a series of questions during her visit to Jerusalem. Most Jewish, Christian, and Muslim commentaries interpreted these questions to be riddles. But in a Late Antique Syriac question-and-answer text, it begins: “Question: What is your God, and what does he resemble, or to what is he likened?Answer: My God is something from which everything else derives, and is exalted above everything; and he has no comparison, and there is nothing that is like him, because everything (else) is changeable and subject to opposition.” The resonance with passages in Q 112 and 42:11 are remarkable, particularly if we think of 112 as an answer (qul) to a question. My hope is that more scholars of Qur’anic studies may be interested in exploring the possible role of question-and-answer material in the Qur’an’s development. As a starting point, I would suggest that this process did not consist of direct borrowing or influence from Syriac texts. Nor is it appropriate to reduce Qur’anic material to Syriac or Christian Arabic debates or a mixture of interreligious conversations. Rather, the Qur’an is an active agent that witnessed question-and-answer events, suggesting its familiarity and comfort with Late Antique question-and-answer styles, both in oral and written form. Given that bilingual Arabic-speaking Jews and Christians were familiar with this material, we should not be surprised to witness the Qur’an employ its own arguments in a similar vein. Further research is needed to grasp the implications of the question-and-answer genre’s relationship to real oral discussions reported in the Qur’an. Likewise we need to understand more fully the ways in which bodies of knowledge were transmitted and transformed via question-and-answer material. The International Qur’anic Studies Association (IQSA) remains an excellent venue for continuing this conversation. © International Qur’anic Studies Association, 2014. All rights reserved. We at the International Qur’anic Studies Association are delighted to announce that membership in our society is now open! Furthermore, the membership is FREE for 2014. (1) العضوية مجانية – To join our academic community today (for free!) simply submit a Membership Form here: http://membership.iqsaweb.org/Join.aspx. Colleagues, if you intend to join us for our 2014 Annual Meeting in San Diego (whether as a speaker or simply to attend), be sure to become a member a.s.a.p., in order to take advantage of the lowest possible registration price for the conference, which will only be available until Thursday, May 22. (The price of registration for San Diego will gradually increase as the time of the meeting grows nearer.) Instructions on how to register for the conference as an affiliate will be displayed upon completion of our IQSA membership form. We look forward to welcoming you as a new member of IQSA and to seeing you in San Diego! The Sixth International Society for Arabic Papyrology (ISAP) Conference—hosted by the Bavarian Academy of Sciences and Humanities (www.badw.de) and organized by the Academy’s Committee of Semitic Philology, ISAP, and the Munich Institute of Near and Middle Eastern Studies—will bring together scholars using documentary evidence for the history of the Early Islamic world (including Arabic, Coptic, and Greek papyri, inscriptions and coins) with scholars working on Semitic languages and writing systems in general. An opening lecture by Hartmut Bobzin (Erlangen) will discuss “The Qur’an and Semitic Studies,” and other presentations will cover a range of issues including the early history and diversification of the consonantal alphabet, phonetic origins of Arabic orthography, the manuscript traditions of pre-Islamic South Arabia, biblical texts in Arabic, and a typology of Qur’anic and other Arabic calligraphies, all of which could have significant implications for the study of the Qur’an text. For more information, and to view the full program and presentation abstracts, see here. The Qur’an has always been a multi-media corpus, but today’s mobile app technology gives us new dynamic ways to experience the Qur’an as word, image, and sound, and to share these experiences with others. With many schools in the U.S. making iPads available for instructional use, I have been able to use Qur’an apps for iPad and iPhone when teaching my own college-level Qur’an course. A search of “Quran” in the iOS App Store brings up over 2,000 results. Here I compare some key features of two apps that are most popular with students in my Qur’an course and that I use regularly in the classroom and for on-the-go research: iQuran v. 3.3 (30 Jan 2013, Guided Ways Technologies) and Ayat v. 1.0 (17 Apr 2013, King Saud University). Both apps are also available for Android, and Ayat also comes in Mac and Windows desktop formats. Both iQuran and Ayat provide the complete Arabic text of the Qur’an with full diacritics and sura headings. In iQuran, if you tap the sura heading, it gives the user information on the sura, such as its verse count, its generally accepted order in the chronology of revelation, its order in the canonical text, and its Meccan and/or Medinan origin(s). While both apps provide a fully vocalized Arabic text, in iQuran the text is color-coded for oral recitation(e.g. letters pronounced with qalqala appear in green), accompanied by concise explanations and audio samples of each pronunciation technique. This is useful for practicing or teaching recitation, and helps users to discern more directly and precisely the connections between the Qur’an’s oral performance and its written form. However, Ayat offers nearly three times as many different audio recordings of prominent Qur’an reciters (over 20, compared to iQuran’s eight), including multiple styles from a single reciter (e.g. three versions of Husari). Such a diverse array of audio files allows the user to compare murattal and mujawwad styles as well as the idiosyncrasies of individual performances. Among the various audio files available in Ayat is an audio of English translation, which would be especially useful for English-language users with visual disabilities or who do not understand Arabic but still want a semantically comprehedible aural experience. Both Ayat and iQuran offer translations in several world languages. For English (the language of instruction for my classes), Ayat offers only one translation, Sahih International, while iQuran offers five popular translations, allowing users to compare multiple interpretive translations and gain a clearer appreciation of the different challenges facing translators as they try to convey literal or figurative meanings, grammatical and stylistic features, etc. Alongside translations, both apps offer choices of tafsirs. The iQuran app has two tafsir choices: Muyassar and Jalalayn, while Ayat has five, including Tabari and Ibn Kathir, as well as an iʿrab option and an English Tafheem, which can be quite useful since comprehensive verse-by-verse English commentaries are relatively hard to come by. So while iQuran may be more useful for studying interpretive translation, Ayat would be better for studying Qur’anic exegeses. an integrative list of verses from various translations, it is harder to trace broader networks of scriptural themes. In any case, the ability to search English translations gives iQuran a distinct advantage over Ayat. Another advantage is that iQuran maintains a list of saved searches, including the search term and which text (Arabic, Pickthall, Asad, etc.) was queried. Saved searches make it convenient to toggle back and forth between different searches and compare their results. This function seems to help remediate the disadvantage of separated English language searches. In both apps you can bookmark verses and tag notes on them, but only in iQuran can you group bookmarks according to your task: reading, memorizing, ideating, or discussing. The iQuran app also allows users to share their search results via email, and share verses in Arabic and/or English via text, email, and popular social media. Overall, the iQuran app has more powerful capabilities than Ayat for searching, organizing, and sharing information about the Qur’an text, while Ayat is distinctly better equipped for studying exegeses, grammar, and oral recitations. I use an LCD cart with speakers and a short-throw projector to share the images and sounds of my iPad with my class, making direct engagement with the Qur’an corpus a central and shared experience. At the same time, most of my students have these apps on their own phones and tablets, so they can directly and creatively interact with the material. Classroom integration of mobile app technology, which most of us are already familiar with and use daily, not only makes discussions more interactive, effective and fun, it also motivates students to explore the Qur’an more independently, even recreationally, outside of class. The portability of mobile apps means that students, teachers, and researchers can conveniently and spontaneously interact with the Qur’an as a dynamic corpus.